Let me guess: You had two tabs open, one of the thread, and All Discussions. You deleted 11 and 38 comments on the two threads, then reloaded the main discussion page. Really? "Release the cookie monster"? Is that something you put in there? I guess it makes sense for them to exist. good catch Mathdude, I never would have noticed with inverted colours. They just look black lol. On a side note I never understood why the forum had a tiny colour to it. I had to tilt my screen back in order to see it puzzle. 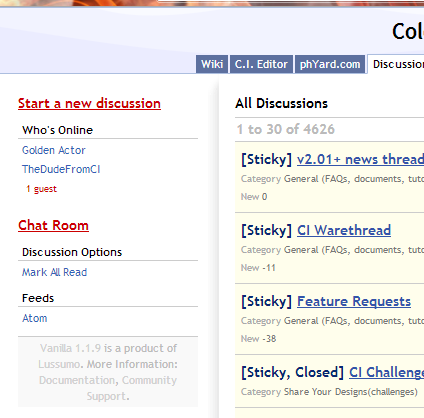 The forum discussions have a slight yellow-orange background to them, almost invisible unless you tilt your screen back. GA's post has that one discussion with a white background in some places, as if it was FILLED IN in paint. Ah, I see now. I had to tilt my screen back too. Yeah I may have changed a few things with my screenshot... Never trust the internet. The other day I forgot my password to a site and the recovery email sent me the password in PLAIN TEXT. That reminded me of a video I watched about security where a guy mentioned that "Google doesn't know your password". Technically, Tapir, if he wanted to, could steal our information on a lot of sites. Most people only use 1 username and password for everything, and the owner of a site has access to the username and password of everyone who joined. Just search their username on Google, and try the password. Boom. 100s or 1000s of accounts could be stolen on many, many different sites. So in simpler terms, by signing up to a website, you are blindly trusting in the admins of that site. The good news is I've seen a lot of people on other sites with the same name (e.g. Wikia, Khan Academy). My username here was chosen by myself, but I don't think I was the first. Good luck trying the same password. And why not Tapir or Xyuzhg? Yay 2 page thread! woohoo! FIRST!